The West African Examinations Council (WAEC) has created a new diet of its examination to cater for a large number of external candidates registering for the examination. The council’s Head, National Office (HNO), Mr Olu Adenipekun, disclosed this at the unveiling of the first series of the West African Senior School Certificate Examination (WASSCE) diet for private candidates on Wednesday in Lagos. According to him, the council has noted that a large number of external candidates are registering for the WASSCE meant for school candidates. He said that this led to an astronomical increase in cheats being caught during the conduct of the examination. “After thorough deliberations on the issue, the governing board of the Council approved that its national offices should begin the conduct of one additional diet every year of the WASSCE for private candidates,’’ Adenipekun said. He remarked that the introduction of one more diet of the examination to the existing two, “is in fulfilment of WAEC’s determination to constantly meet the demands of stakeholders’’. The new diet is slated to hold in January/February 2018. This is in addition to the existing May/June WASSCE for school candidates and the November/December diet for private candidates. This brings to three, the number of examinations to be conducted by the WAEC every year with effect from 2018. 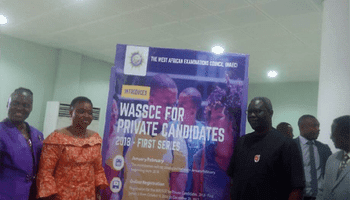 On April 13 this year, the Registrar to Council, Dr Iyi Uwadiae, announced at a news conference in Lagos that the council had approved the conduct of an additional diet of the WASSCE for private candidates, beginning from 2018. “The conduct of this additional diet of the WASSCE for private candidates became necessary because the WASSCE for school candidates is written first every year. “And the results are released before the conduct of the WASSCE for private candidates. According to him, the flagging off of the new diet is starting with Nigeria. The HNO noted, however, that the remaining member countries of WAEC had indicated their readiness to follow suit. Adenipekun explained that the first series of the ‘WASSCE for private candidates in 2018 would be an urban-based examination. According to him, candidates will be examined in 19 subjects. “Centres for this examination will be located in cities and urban areas where we have a large number of the candidates. “We will start with that for now and then gradually, we continue to spread to every nook and cranny of the country,’’ he said. Adenipekun said that the council would continually deploy technology in its fight against examination malpractices. He added that the council was determined to win the war against the scourge. He called on all stakeholders to join hands with the council in the fight against examination malpractices. According to him, this is necessary toward ensuring that the integrity of the examination is not compromised.